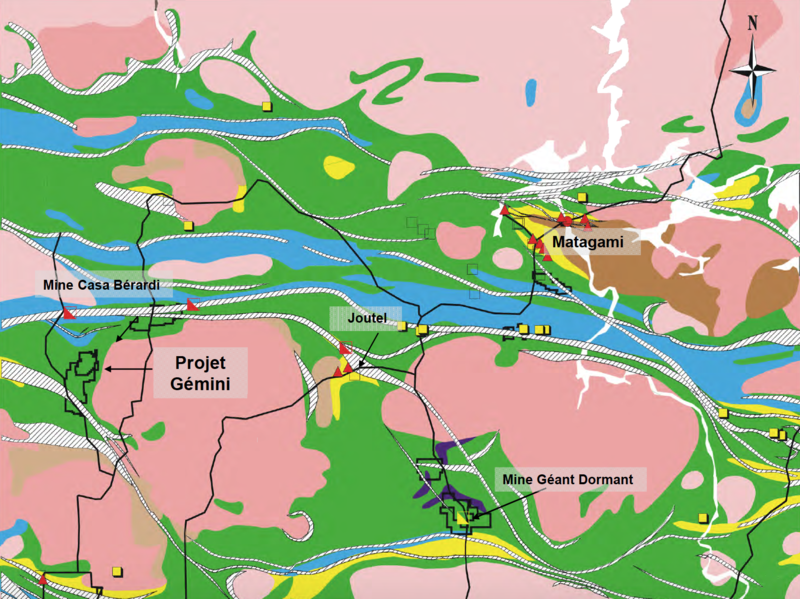 The Gemini-Turgeon property is located 80 kilometres north of La Sarre in Abitibi, Quebec, in the Laberge and Casa-Berardi townships. It is accessible by road all year round. The property results from the merging of two contiguous mining properties: the Gemini property (338 claims, 5341 ha) and the Turgeon property (125 claims, 1043 ha). The property was optioned by Cambior Inc., now IAMGOLD Corporation, in 2003. IAMGOLD is currently the operator of the joint venture. Turgeon claims: 50% Yorbeau, 50% IAMGOLD, with a 2% royalty in favor of Teck Resources. The principal lithological units of the property are essentially mafic and felsic volcanics of the Gemini Group. These volcanics are overlain to the west by sedimentary and mafic volcanics belonging to the Dieppe Group through a major thrust fault. To the east, they mould the western margin of the Mistaouac batholith. The Gemini thrust fault is characterized by a high graphite content. Its orientation passes from NNW in the south to NNE in the north with a dip of 45 to 55°toward the west. The general orientation of the volcanic units of the Gemini Group is parallel to the fault with dips varying between 45 to 70° towards the west. A few felsic intrusive masses and dykes of various compositions have been introduced through the volcanics of the Gemini Group. The Laberge regional deformation zone affects the units in the southern part of the Gemini sector. 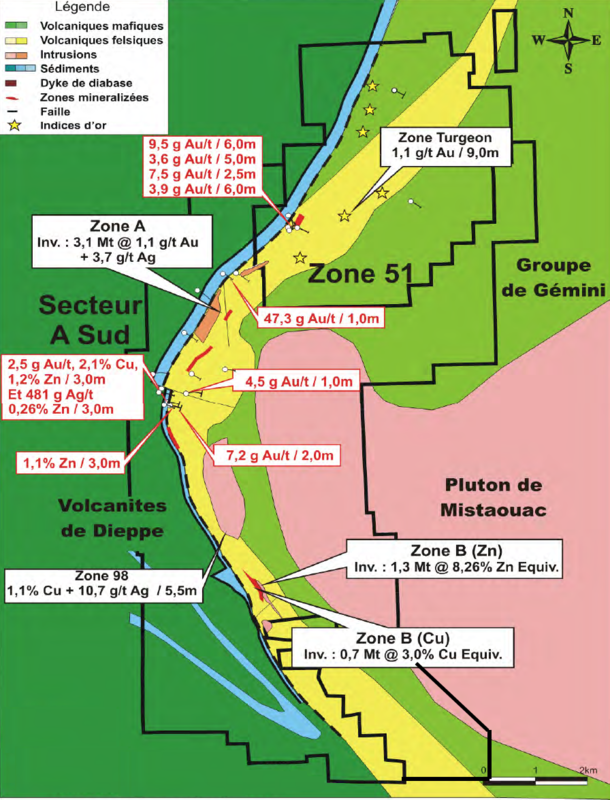 130 Zone: 3.0 metres grading 0.46% Zn, 2.02% Cu, 35.3 g/t Ag and 2.9 g/t Au in felsic volcanics. The 51 Zone: 9.5 g/t Au over a length of 6 metres near a major fault in association with a strong carbonatization of the country rocks. In addition, several drill holes have intersected narrow zones mineralized with base metals and/or gold throughout the property. 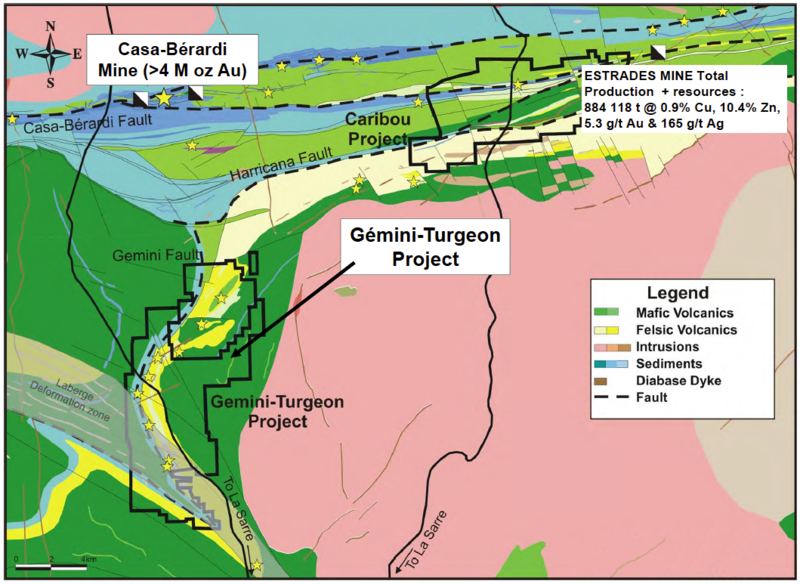 IAMGOLD, as operator of the joint venture, has done only minimal work at Gemini-Turgeon since 2008.